In today's plastics industry, effectively integrated quality management is essential for zero-defect, state-of-the-art production technologies. Within quality management, detailed knowledge of the state of the materials utilized is necessary in every step of the processing chain, since the quality of the polymers directly affects their processability and suitability for end products. Differential scanning calorimetry is the most important method of thermal analysis. The key focus of this article is a holistic solution with the objective of simplifying the application of DSC for plastic converters such as compounders, extrusioneers, rotary molders, and injection molders. A streamlined approach has been developed by NETZSCH Analyzing and Testing to perform DSC analyses in such a way as to significantly simplify the required individual steps to obtain reproducible and meaningful results. The NETZSCH 360° view for thermal characterization as shown in Figure 1 is a systematic, streamlined approach for performing high-quality characterization. The new DSC 214 Polyma, as shown in Figure 2, supports this for the thermal characterization of polymer materials in settings ranging from the academic research laboratory to industrial processing plant. The main aim of NETZSCH 360° is a customer-oriented solution covering the entire polymer characterization chain as shown in Figure 3 - from easy sample preparation to a polymer-specific DSC device to smart evaluation of the results to lean documentation. The customer is supported by enabling characterization of the thermal properties of polymer granules, molded plastics, and rejected parts in an easy, fast, reliable and reproducible manner. The NETZSCH 360° solution helps in identifying even the slightest differences between the different polymer samples by means of DSC which is accessible to everybody, independent of their knowledge about polymers. The first step for any characterization is always sample preparation. The composition of the sample should be representative of the much larger granule or part. A tiny sample of approximately 10mg is sufficient for DSC analysis. The mass should be accurate to within ± 5% for better sample comparison. The portion of the sample in direct contact with the aluminum pan should be planar in order to ensure good contact. The SampleCutter as shown in Figure 4 was designed with these requirements in mind to assist in sample preparation. A DSC test is done using two Al pans, a reference pan and a sample pan, placed onto the round DSC sensor inside the DSC furnace. From a thermodynamic point of view, these pans must have a form-fitting contact to the sensor to ensure optimal heat transfer between the pan and the sensor. As a solution, the company offers the new Concavus pan. As the name of Concavus indicates, the Al-pan has a non-flat, concave bottom geometry. The new Concavus pan is recommended for all commercial heat-flow DSC devices, as it significantly helps improve the measurement reproducibility of the DSC signal - from user to user and from sample to sample. 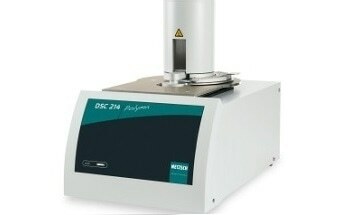 The DSC 214 Polyma features a small footprint. The newly designed DSC sensor and furnace offer optimized thermal resistance and high signal sensitivity and reproducibility as shown in Figure 7. The Corona sensor enables detection of the slightest temperature deviations between the reference and the sample pan. With an indium response ratio greater than 100 mW/K, this sensor delivers high-resolution measurements in combination with significantly increased heating rates. Figure 7. Ideal combination of Arena furnace (a), Corona sensor (b) and Concavus crucibles (c). The concave area is an exaggerated image for better illustration purposes; in reality, concavity is only approx. 10 pm. The new, improved version of the NETZSCH Proteus® software (v. 7.0) developed specifically for the DSC 214 Polyma offers two operating modes, called ExpertMode and SmartMode as shown in Figure 8. The objective of SmartMode is to make DSC analysis accessible to less experienced users to start a measurement with a minimum of input required. The user can define a reliable measurement within a minute due to available wizards for frequent tasks using a new GUI. With the AutoCooling function, the most suitable cooling device (i.e. liquid or gaseous nitrogen, intracooler or compressed air) and temperature program are selected automatically by the software from pre-defined, optimized cooling programs, guaranteeing ideal temperature control and optimized energy consumption, especially for the liquid nitrogen option. With AutoCalibration before measurement, the software automatically selects the best available calibration file for the measurement, relieving the customer of performing time-consuming instrument calibrations. Using autocalibration the software also reminds the user when a calibration is necessary and carefully guides the user through the calibration procedure. Analysis of raw DSC data normally requires trained personnel and expert knowledge to identify thermal transitions in the polymer such as glass transitions, crystal relaxations, and crystal melting. It is possible to easily customize the Identify database due to the ability to archive measured data. This enables easy access to previous measurement data at any time. The NETZSCH 360° view for DSC technology is a comprehensive system solution specifically tailored to the polymer processing industry. The entire sequence of thermal analysis activities are supported from sample preparation to DSC testing, user-independent evaluation and documentation of the test results. The new DSC 214 Polyma along with the accompanying automatic sample analysis and identification features of the Proteus® 7.0 software greatly simplifies the characterization of polymers by means of DSC. Hence the user is provided with an all-inclusive system solution considering all aspects to guarantee high-quality DSC measurements on neat polymers and finished plastic parts. Never have DSC measurements been so easy while maintaining the well-known NETZSCH quality.